Smith Machine Training Tip: Watch The Angles! Surprisingly, not all Smith machines are created equal. Learn the difference between totally vertical and angled Smiths so you never get caught performing an exercise in the wrong direction! The Smith machine is an extremely useful piece of equipment. Because of the fixed bar path, it allows you to push as much weight as possible without having to worry about stabilizing the load. It also allows you to rack the bar at just about any place along the posts, which means you can do partial-rep training and work through a shorter range of motion to strengthen your weak points. Yes, many lifters are aware of these advantages, and they rightfully make the Smith an important part of their training tool chest. What some lifters may not know, however, is that not all Smith machines are created equal. Some Smiths are completely vertical, where the weight-bearing posts run straight up and down, while others actually have slightly angled weight-bearing posts. Notice that the Smith machine on the left is completely vertical, while the Smith machine on the right has slightly angled weight-bearing posts. Think about the Smith machine in your gym, or take a careful look next time you're there. Does the bar track straight up and down, or does it travel along a slightly angled path? While the difference here seems minimal, it's actually rather critical in terms of exercise safety and effectiveness. Most free-weight exercises have a natural bar path. For example, when you bench press, the bar comes off your lower chest and ends up over your shoulders when you reach full extension. You naturally press the bar up and back, not down toward your belly button. But what happens when you bench on the Smith machine? Well, if your Smith machine is the straight-up-and-down type, your orientation toward the bar doesn't matter. Whether you're doing bench presses, squats, or overhead presses, you can face either way in the machine since you push the bar in a 180-degreee vertical path. In other words, there's no "wrong" way to face. But with an angled Smith machine, depending on which way you orient your body to the bar, you can either bench press up from your lower chest and back toward your head, or with your body facing the other direction relative to the angled posts, up and away from your face. Depending on which way you orient your body to the bar, you can either bench press up from your lower chest and back toward your head, or with your body facing the other direction relative to the angled posts, up and away from your face. The first movement path is safe and effective, but the other is counterproductive and can put your joints at greater risk because you're pushing along an unnatural pathway. Clearly, how you're oriented to the bar on an angled Smith machine is important—not just for bench presses, but for incline bench presses, overhead presses, close-grip bench presses, decline presses, squats, lunges and other exercises. When most trainees set up an exercise inside a Smith machine, they usually just try to face the mirror. They don't necessarily think about the movement path. However, seeing yourself in the mirror should be a non-factor with angled Smiths. When using an angled Smith machine, you always want to consider the natural path of the bar on a given movement. If you're not sure, start with an empty bar, which allows you to test your body position in relation to the bar and its path. Adjust your bench, or even reverse direction, to ensure you're in the right spot in both the bottom and top positions of your exercise. The bar path should always mimic the free-weight version of that movement as closely as possible. With angled Smith machines, you've got to do a little thinking ahead of time to ensure you're facing the right direction. 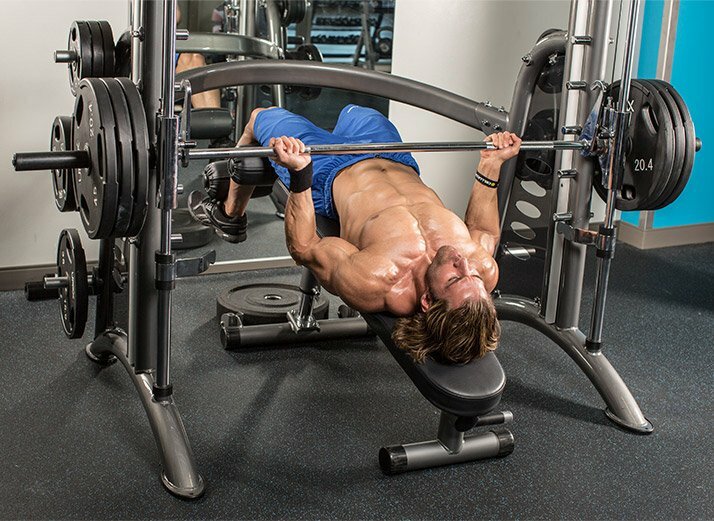 Don't let the machine's proximity to a mirror fool you; if you just pay attention to the mirror, you may end up benching in the wrong direction!